Named after the Epsilon Aurigae binary star system, the Epsilon™ series of waterblocks is a single slot, full cover liquid cooling solution for dual GPU graphic cards. 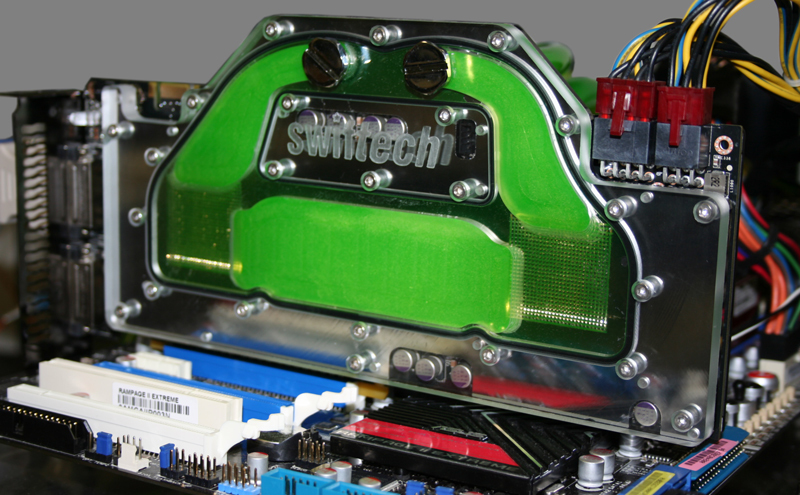 "Full cover" means that the waterblock cools both GPU's, Voltage Regulators, I/O chip, memory modules, and other critical components. * The Epsilon GTX295, for nVidia® reference design (P658*) GeForce™ GTX295 graphics cards, is available with either clear polycarbonate or black acetal housing. The Epsilon™ waterblock offers superior thermal performance at the GPU level thanks to an embedded thin-pin matrix located directly above the GPU areas. Flow restriction is moderate by design in order to take into account multiple water-blocks in the same loop. High thermal conductivity grease pads are pre-applied in the memory and mosfet areas for user convenience. Inlet and outlet ports are G1/4 compatible and spaced to accomodate large compression fittings. Short fittings are available for quad SLI setups. The CNC machined copper base is chrome plated for a durable and bright finish. Stainless steel standoffs are used to guaranty safe and reliable mounts to the PCB.